(i) The National Council of Educational Research and Training (NCERT) has recommended only two books (Language and Mathematics) for classes I & II and three books for Classes III to V (Language, Environmental Studies and Mathematics). NCERT has also made available all their textbooks for free access through the web (epathshala.nic.in) and mobile devices. (ii) The Central Board of Secondary Education (CBSE) has directed schools affiliated to it to ensure that students do not carry school bags till Class II. 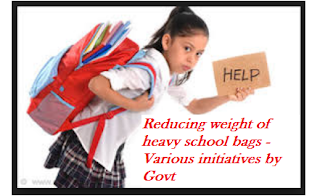 In its latest circular dated 12th September, 2016, it has advised all its affiliated schools to take all possible measures to keep the weight of school bag under control. (iii) Kendriya Vidyalaya Sangathan has taken a number of steps to promote digital learning in its Vidyalayas. To begin with, all the students of class VIII in 25 Kendriya Vidyalayas (One KV from each region) shall be provided with good quality Tablets on PILOT BASIS. The students will use these Tablets as also their teachers for Mathematics and Science for enhancing their core skills in these subjects. Education being a subject in the Concurrent List of the Constitution and the majority of schools are under the jurisdiction of the State Governments, it is for the respective State/Union Territory Government to take appropriate measures to reduce the weight of schools bags of the children studying in their schools.